Haley and the Trump administration have gone beyond Powell and the Bush administration in dragging U.S. intelligence agencies into their hostility-selling campaign. 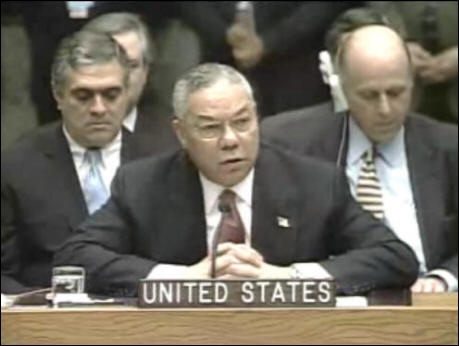 For Powell’s speech, the imprimatur of the intelligence community was symbolized by Director of Central Intelligence George Tenet sitting in the camera frame right behind Powell. Although Haley is the U.S. ambassador to the United Nations, such an image in the Security Council chamber evidently wasn’t enough. Instead, she did her show-and-tell at the Defense Intelligence Agency in Washington. And rather than a small vial that Powell used as a prop in talking about a biological weapon, she displayed a warehouse full of wrecked hardware, including the missile remnants. Just as in 2003, the show missed the fundamental issues involved in the relevant Middle Eastern mayhem. 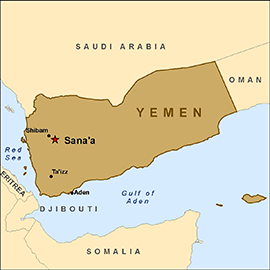 The missile fired at Riyadh was a rather feeble and ineffective response to the continuing air assault on Yemen by a Saudi-led coalition that has turned a civil war sparked by tribal disgruntlement into one of the world’s biggest current humanitarian disasters. According to the United Nations and other sources, more than 5,000 civilians have been killed, along with the thousands of injuries and other deaths as well as related consequences such as a cholera epidemic that has killed thousands more. The Saudi-led air war is clearly the biggest source of the carnage. The United States aids that air war. The exact nature and extent of the assistance are unclear, but what is publicly acknowledged includes U.S. provision of targeting information and refueling of Saudi warplanes. The Trump administration reportedly has considered increasing the military assistance to Saudi Arabia, including possible resumption of shipments of guided missiles that the Obama administration had suspended because of the indiscriminate Saudi targeting of civilians. 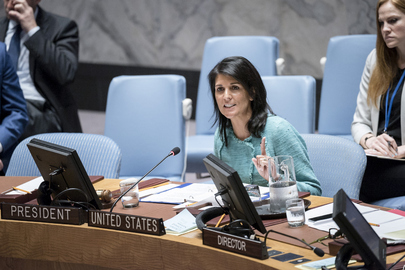 It is both misguided policy and morally offensive for Haley to try to focus attention on Iranian-related markings on a missile fragment while her own government abets far more suffering and destruction in the same war of which that missile was a part. Haley’s remarks at the show-and-tell did nothing to explain how the munitions displayed around her demonstrate anything about either Iranian policies or the drivers of conflict and instability in the Middle East, much less about implications for U.S. policy. Saudi Arabia and the United Arab Emirates had handed over the materiel, and U.S. officials either would not or could not say where much of it had been recovered. Nor could they say when the weapons had been supplied or when they were used. To use such military detritus as a basis for conclusions about what Iran is or is not contributing to violence in the Middle East makes little more sense than holding Mikhail Kalashnikov responsible for all attacks in which AK-47s have been used. Officials of the United States — the world’s leading exporter of arms — ought to be especially careful about suggesting that factory markings on munitions equate to evidence about a country’s foreign policy, given how U.S.-origin arms have been used even by the likes of ISIS. That’s right, we do not. And the administration’s upending of normal procedures for the sake of the public hostility-stoking campaign shows how far removed any of this is from a healthy and proper use of intelligence services. Haley knows well that the only obligations that Iran undertook in either the JCPOA or the U.N. resolution that endorsed the agreement concern nuclear activities. The reference in Resolution 2231 to missiles was intentionally and carefully worded as a “call” that entails no additional obligation. The Secretary-General’s report, like most such U.N. documents, is more a compilation of reports and assertions by member countries than the reaching of any grand conclusion. A U.N. monitoring committee did investigate missile firings by the Houthi forces in Yemen earlier this year and expressed agnosticism about who was involved in supplying the weapons, even though they appeared to be of Iranian design and manufacture. The monitors also stated they saw no evidence of something else Haley has suggested, which was a presence of Iranian missile specialists within Yemen. In the international scrutiny that matters most in assessing Iran’s compliance with its obligations, the International Atomic Energy Agency continues to certify that Iran is meeting its nuclear commitments under the JCPOA. No, Iran isn’t supporting that at all. There is zero evidence of any Iranian move toward obtaining a weapon with intercontinental reach. There is no evidence that Iranian military development and procurement are proceeding with anything in mind other than responding to what Iran sees as threats and rivals within its own region. The heads of the Iranian military and Revolutionary Guard Corps have talked publicly about 2,000 kilometers being a sufficient range for Iranian weapons to meet that need. Such a range is not just talk and is consistent with the larger strategic logic of Iran’s defense posture. It is a harmful waste of the time and attention not only of the U.S. ambassador to the United Nations, but also of all the intelligence officers who were involved in putting together that display at DIA, to be hyping an imaginary intercontinental threat when the United States faces a real one from North Korea.